The round back design of Ovation Guitars improves sound projection and balance. This design improves tonal quality. However, this round back style causes "the problem" Ovation players experience. 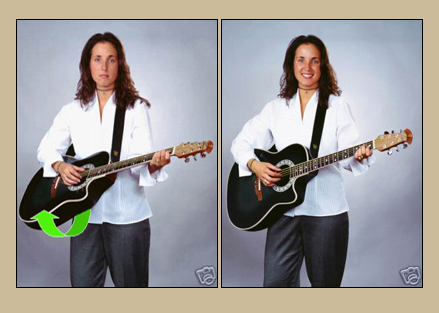 Holding a "roundback" guitar against your body in the standing position is challenging and affects playing comfort. The level of performance can suffer while battling this instability. A "Standing Ovation!" 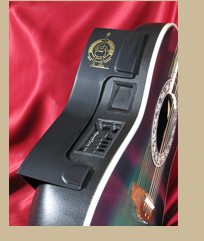 A "Standing Ovation" is a molded accessory that creates a comfortable, flat surface on the back of your Ovation Guitar. The "Standing Ovation" is created from the same material as the back of your Ovation Guitar. 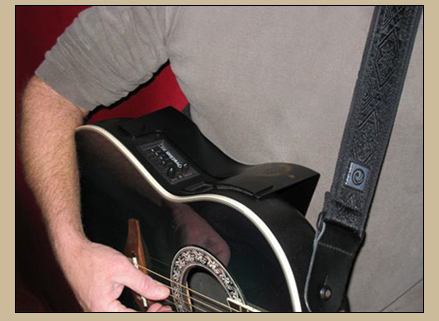 This product is simple to install, using Velcro tabs which attach to the back of the guitar. It is easily removed, and then attaches to the case for storage and/or travel. Attaches easily to the back side of your Ovation Guitar. Attaches to case for storage and travel.